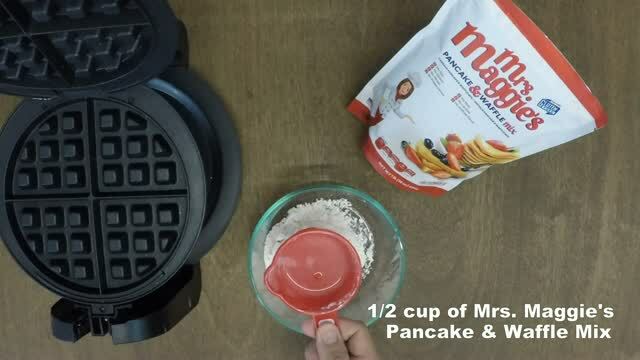 Mrs. Maggie's is the best Gluten Free pancake and waffle mix! Tapioca Starch (Yuca/Cassava), Cornmeal, Brown Sugar, Baking Powder and Salt. 1/2 cup of the best Mrs. Maggie's Pancake & Waffle Mix + 1 egg + 2 tbsp (30 ml) of water, mix together and pour into a preheated skillet for pancakes or pour into a preheated waffle maker. + 2 tbsp (30 ml) of water, mix together and pour into a preheated skillet for pancakes or pour into a preheated waffle maker. Enjoy the best gluten free/vegan pancake or waffle!!! "For better view turn the device to landscape (horizontal) position"